Sculpted by Grinling Gibbons or one of his pupils this is considered a very fine statue. It is a pair with that of Charles II, James's brother and predecessor, at the Royal Hospital, Chelsea, in that they were both commissioned by Tobias Rustat. 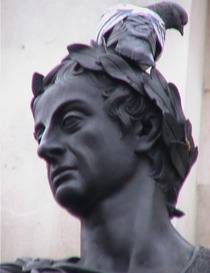 A strong contender for the title "campest statue in London", this statue has seen more of London than most, starting off in the Palace of Whitehall's Pebble Court, behind the Banqueting House; moved to the garden of Gwydyr House, in Whitehall; re-erected in the forecourt of the New Admiralty building; stored in Aldwych tube station during WW2; and now here.